This Baked Tilapia with Mediterranean Vegetables Recipe is an amazingly simple meal that’s impressive enough for dinner guests. 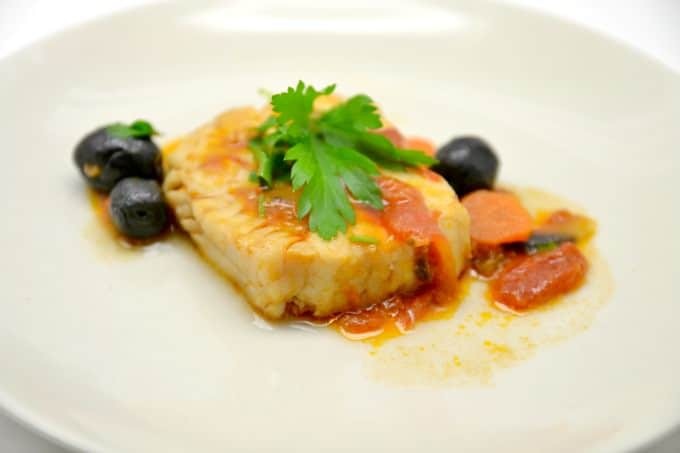 Since there’s no frying involved, you can even start with frozen fish, so it’s perfect for busy weeknights, too! Ten years ago, tilapia was relatively unheard of in the United States. Here, we tend to eat cod, salmon, trout, catfish, and occasionally halibut. But tilapia has an ancient history and is said to have been the favorite of Pharaohs. Some Biblical scholars claim it was the type of fish that Jesus multiplied to feed 5,000 at the Sea of Galilee. Tilapia, even back in those times, is a farm-raised fish. In modern times, tilapia is farmed by sectioning off an area of a lake so the fish can swim freely but can also be easily fed. It’s what they’re fed that affects the nutritional value of tilapia. In countries like China, there is little to no regulation of the fish-farming industry, so these vegetarian fish are often fed animal manure because it’s cheaper than the commercial fish food. Tilapia raised in Ecuador, where most of the tilapia eaten in the US originates, is subject to more stringent regulation. Both the Monterey Bay Aquarium’s Seafood Watch and the Environmental Defense Fund’s Seafood Selector give Ecuadorian, US, and Canadian-raised tilapia their approval. With all of that going for it nutritionally, it’s no wonder that tilapia has become one of the country’s favorite fish! 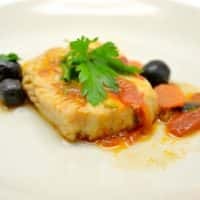 Now, thanks to this super easy Baked Tilapia with Vegetables recipe, it can become one of your family’s favorites, too. Ready in minutes even if you start with frozen fillets. 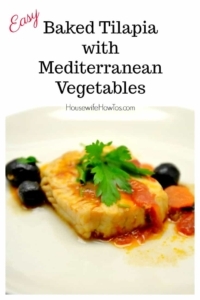 Use the Mediterranean vegetables as listed or substitute your family's favorites. Rinse tilapia fillets under cool water and pat dry. Place in the baking dish and spray lightly with cooking spray. Season with salt and pepper. On stove, heat 1 tbsp. olive oil in a skillet over medium-high heat. Saute onions until they begin to turn translucent (approx. 3 min). Add garlic and, stirring constantly, cook until fragrant (around 2 more minutes). Add one (1) chopped tomato and cook until it begins releasing its juices (about 3 minutes). Spread this over the tilapia fillets then sprinkle with remaining tomatoes, olives, and capers. Bake uncovered for 20 minutes. Sprinkle with Feta or goat cheese if using and return to oven for 2 minutes or until the cheese is melted. Pop a few homemade marinated artichoke hearts on the plate and serve with a good bread or other starch for a filling, delicious meal. Bonus tip: Make your own cooking spray by combining 1 cup olive oil and 1 tbsp. water in a spray bottle. Shake well before use, and store in a cool, dark place.